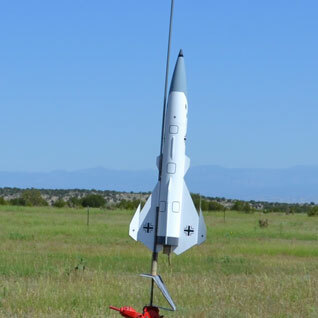 Click the button below to add the Shrockets Flying Model Rocket Kit Skonk Wulf SHR 05153 to your wish list. 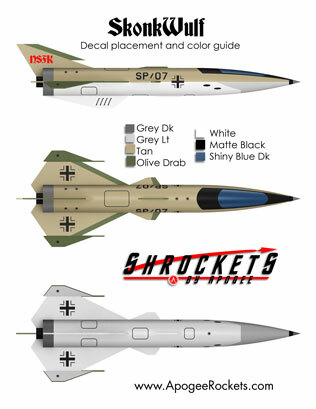 This rocket-powered fighter is what might have been developed in a parallel universe where the NAZI's won World War II. It is a great example of retrofuturism from the creative mind of Shrox. The easy-to-build kit features through the wall fins, colorful self-adhesive vinyl decals, and a color plastic parachute. Flies on 24mm C, D, and E size rocket engines. The Skonk Wulf features a unique appearance called "Dieselpunk styling." Similar to the Steampunk genre, it gets its appearance from imagining what might have been created in an alternate timeline of reality. In this case, "what might the rocket fighters of today look like had the Nazi's won World War II?" This rocket lets you imagine that story with its retrofuturistic appearance. 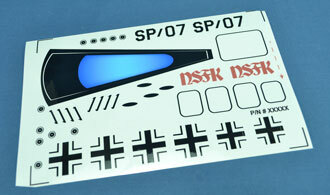 The design was originally available as a plan pack by Shrox on his website. Apogee acquired the rights to produce it as a full kit. The outside shape and styling were left alone, but internally the rocket was improved. It now has laser-cut components and through-the-wall fins for ease of assembly and increased strength and durability. Apogee also added self-adhesive vinyl decals as an extra touch of class. The rocket flies like a bullet on 24mm diameter motors. Start out with a C11-3, and really wow the spectators with D's and E's. This rocket is is rated as a Skill Level 3 rocket on the Apogee Components complexity scale. That means it is "average" and isn't too hard to make. The core of the rocket is relatively simple to put together and you probably won't even think twice about it because it has laser-cut parts and a beautifully slotted tube. The tube is even pre-marked for the location where the two decorative strakes are glued on. 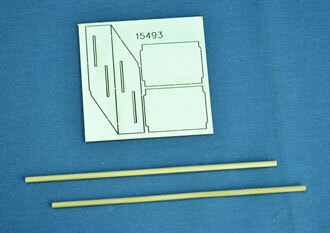 There are two somewhat unique construction techniques that are involved in the assembly of this kit. The first is that the tips of the wings are angled downward as seen in the photo here. Because of the challenge of putting the tips on at the correct angle, we've included a special dihedral jig to make alignment easier. You'll be amazed how angling the tips really enhances the appearance of the rocket, and they actually make it more stable when flown too. The second unique construction technique is that the wings are made up of three separate panels that have to be glued together before they are attached to the rocket. This should be done on a flat surface so that the rocket looks uniform and even when the wings are glued on. The Skonk Wulf comes with a large 18" diameter plastic parachute. This highly visible canopy helps you see the rocket in the sky and when it lands on the ground. While this is marketed under the brand name "Shrockets by Apogee," all the components are actually from Apogee Components. Because it comes from Apogee Components, you expect it to have high quality. And this kit lives up to that expectation. When you tear open the bag, you'll find these parts inside. 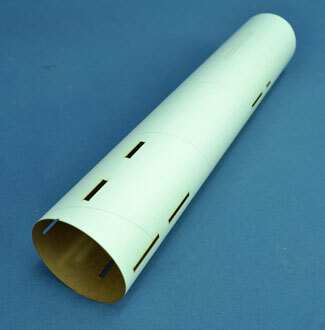 Premium Quality Body Tubes - The tubes are thin-wall to reduce weight, but are plenty strong for this model. The surface is slick and smooth, which makes marking lines on them easy. Painting is also a breeze since the spirals are tight and require little filling. We laser-cut the slots for the through-the-wall fins, as well as etching on the tube the location where to glue the decorative strakes, so there is very little measuring required. This saves you time and gives you the certainty that you assembled the kit correctly. Plastic Nose Cone - This high quality nose cone requires almost no finishing - just a coat of primer and paint, and you are ready to go! 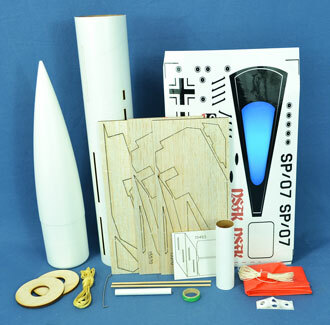 Laser-cut balsa wood fins - Balsa wood is very lightweight and therefore helps to make the rocket zoom higher and faster into the sky. 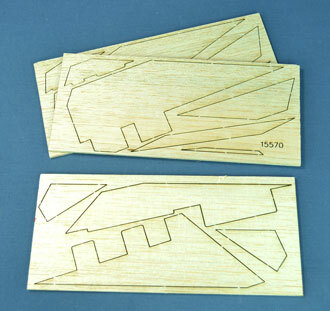 Having the fins laser-cut means that each fin is pre-cut to size with the precision of a machine. There are no crunched edges. They also have tabs on the root edge of the fin to go into the slots on the body tube. This assures that the fins are straight - so your rocket flies nice and steady every time it is launched. 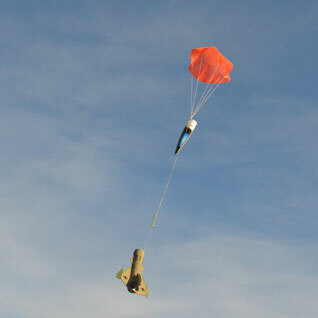 Durable 18" Diameter Plastic Parachute - The kit comes with a colorful chute that makes it easy to see your rocket as it comes down from super-high flights. We chose orange because it makes it easy to see the rocket if it drifts a long distance down range. We've lost our fair share of rockets, so we know what a high visibility chute can do to increase the odds of you getting the rocket back if you fly it high. 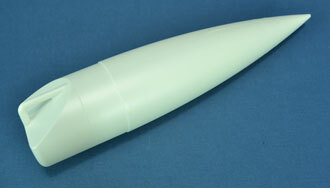 At Apogee Components, we use a thicker cotton thread for our suspension lines than any other rocketry manufacturer. The thickness makes it easy for you to tie knots because it is easier for your fingers to hold. It is little features like this that we think about, as we want your experience to be the best and easiest. The model also comes with High-Strength Kevlar® Shock Cord. Kevlar is six times stronger than steel and is also heat resistant. It can easily withstand the high heat of ejection, ensuring the rocket descends as a single piece. This makes for a very durable rocket that can be launched again and again. Color-coded centering Rings make assembly easy. You don't need to know technical names of the individual parts. Just grab the one that is the right color. Spring steel engine retainer clip allows you to swap out engines between flights in just milliseconds. It is really that fast! You have the option to leave the hook off when you build the kit. This lowers the weight of the rocket and allows it to zoom higher into the sky. Standard-Size 1/4 inch Launch Lugs - This kit is light enough to fly off a large mid-power launch pad. 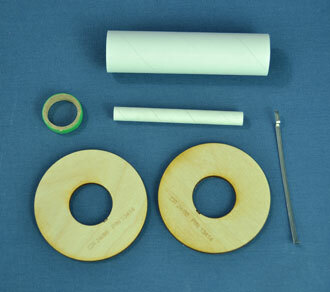 Plywood Centering Rings are used in this kit instead of rings made from paper because we felt is would give the rocket more durability. These are also laser cut for extra precision. To make a perfectly symmetrical wing, you need quality fixtures to aid the assembly. 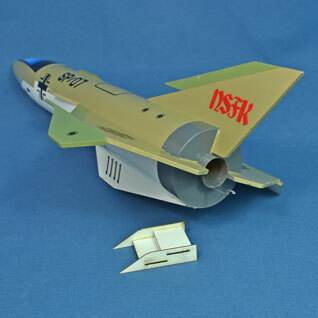 That is why we went to the expense of laser-cutting the dihedral jigtool for you from premium quality card-stock paper. We want your rocket to look great and fly even better. Wood Dowels are used to simulate the futuristic laser or gun barrels on this rocket. We've pre-cut them to length to make your job assembling the rocket even easier. Pre-cut, colorful pressure-sensitive decals - This is a big reason why it is so easy to make this rocket awesome-looking. It is just a matter of applying the sticker-like decals. Since they are pre-cut for you, you'll save a lot of time applying the decals to the rocket. 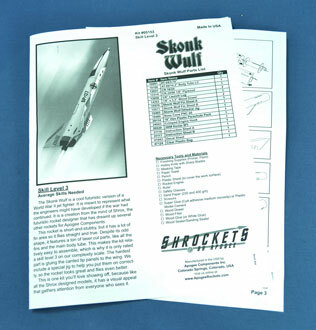 Easy to follow instructions - The Skonk Wulf plans that Shrox originally sold came with great instructions. But since we re-engineered the rocket to add the through-the wall fins and the dihedral jig, we decided to create a whole new set of instructions. We spent a considerable amount of time illustrating our instruction sheets to make them easy to follow. The reason is that your experience building this rocket should be as enjoyable as possible. And you'll be impressed by how much information the instructions contain. 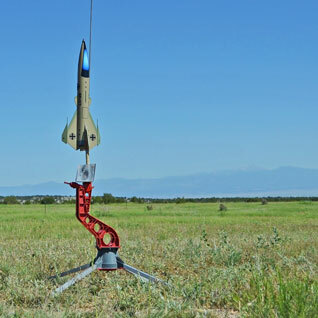 Not only will you learn about this rocket, but the information can be used in all of your other rocketry projects too. If you have lost your instructions, you can download them here in pdf format.